A gambrel roof is most closely associated with a barn structure but can be found on various older buildings. 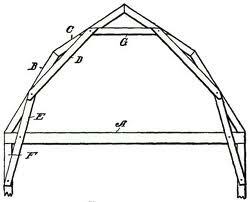 Because of its extra joints as compared to a simple gable roof, a gambrel roof can become unstable under high wind loads. Common solutions include reinforcement or bracing of the joints. Providing additional support through interior load-bearing walls can be considered, but special attention must be paid to the ultimate support of such walls.